One way to look at the use of surfactants in cleaning is that the solubility of oils is maximum when HLD=0. Alternative ways of looking at the issue are discussed below and point to complementary apps. For aqueous cleaning it is obvious that the water must wet the object. For that a low surface tension is required so a surfactant is necessary. That minimum requirement can be attained with just about any surfactant. There are some subtleties about how quickly the surfactant can come to the surface of a fresh drop of water, and any foaming surfactant would be unattractive for any cleaning other than for households where "foam"="cleaning" is too engrained to allow efficient foamless surfactants to be much use. So in general, any surfactant will meet this minimum requirement. Yet we know that for different soils different surfactants are required. 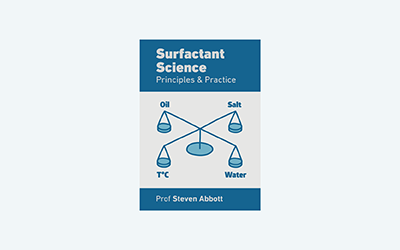 This page focusses on the emulsification process which is the most powerful mechanism and the one for which the surfactant must be most fine-tuned. Solubilization is discussed within the hydrotropes section of Practical Solubility and in general will be a minor component. Roll-up (the next page in this section) is a very generic mechanism that works with most surfactants but only if the soil is a hydrophobic oil and the surface is hydrophilic - it is therefore irrelevant to many important cleaning processes, but if you know you can use roll-up then any convenient surfactant will do a good job of removing the oil from the surface. What happens to the oil after removal is a different issue. In many circumstances, it turns out that the most efficient cleaning takes place when the interfacial energy between the water and the oil is small - i.e. HLD=0. Many ethoxylate cleaning systems achieve this at the so-called PIT (Phase Inversion Temperature). And somehow PIT cleaning is seen as something smart. In fact it's just one way, amongst many, of getting to HLD=0. So, for efficient cleaning, know the EACN of your oil, identify the working temperature (sometimes it has to be high to melt the oil), identify whether there is any salinity, then identify the ideal Cc of a surfactant to obtain HLD=0 under those conditions. As with EOR and Cosmetics, the efficiency of the system depends strongly on the surfactant parameters such as MWt, Head Area A, Tail Length L and the ξ parameter. It is unlikely that any single surfactant will give you exactly what you want. But once you know the ideal Cc value, you can use the Cc blending calculator in the Basics section to find a good balance. Of course getting the oil away from the solid surface is merely the first, essential step in an overall cleaning process. Via mechanisms not discussed here, other types of surfactant (e.g. the polymerics) are often required to avoid re-deposition of the oil.